Since 1985 ACS Motion Control has developed and manufactured advanced multi-axis motion controllers and integrated control modules. Our main focus has been ease of use while maintaining the power and flexibility required by a broad range of machine automation applications. Our products are used in packaging, printing, robotics, linear stage control, semiconductor manufacturing and testing, electronic assembly and testing, medical imaging and advanced digital printing industries. Our products are the result of close cooperation with our customers in developing solutions that give them a competitive advantage. ACS Motion Control manufacturing facility is ISO9001 certified. Every unit is thoroughly tested using the latest available techniques. Testing includes connecting motors and drives, a demanding burn-in cycle, and full functional testing. Taking into consideration ACS Motion Control decades of experience, advanced software and hardware capabilities and end-to-end user support, our products clearly provide the first-class cost-effective solutions that you're looking for. guarantees performance at a fixed update rate of 20kHz with 48-bit accuracy, for all axes . The MPU is a standard miniature Pentium-like PC that manages each SPii processor. The MPU handles high-level tasks, including axis profile generation, host/controller communication, user-program execution, and safety event handling. 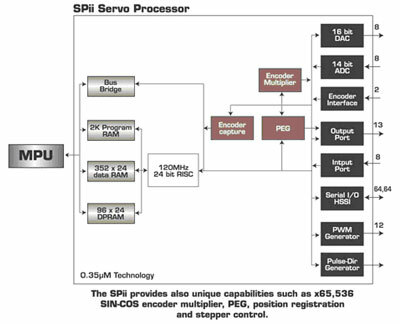 SPii stands for ACS Motion Control second generation ASIC Servo Processor. The SPii ASIC is based on a 120MHz RISC core designed and optimized by ACS Motion Control for real time motion control algorithms. It combines all the peripherals required to implement a complete, high-performance, all digital motion control system. All of our standard and customized OEM SPiiPlus control products are based on the SPii processor. The SPiiPlus offers a powerful feature known as a Sin-Cos Encoder Multiplier. When nanometer axis position resolutions are required, users have usually been limited to expensive laser interferometer feedback systems. With the internal SPiiPlus Sin-Cos Encoder multiplier, users can use the much less expensive analog Sin-Cos encoder with 1Vptp differential outputs to achieve the required high resolution. The maximum theoretical Sin-Cos encoder multiplication factor is 65,536. The maximum velocity is not dependant on the selected multiplication factor, and is limited to 250k sine periods per second. To achieve even higher frequencies please contact your ACS Motion Control sales representative. The SPiiPlus PCI and linear drives were tested on a high performance XY table used for wafer inspection with Sin-Cos encoder resolutions of 4nm (250 lines per mm). Using a multiplication factor of 8,192, our engineers measured a jitter of ±2 encoder counts, which is equivalent to ~1nm. At this high resolution, the axis achieved velocities up to one meter per second. The servo performance of an axis can be defined and measured by three main parameters: settling time, jitter (standstill when motor is under servo) and constant velocity. With our advanced software tools including a four-channel soft-scope, these three parameters are easily monitored and analyzed. Axis settling time has a direct impact on total machine throughput. With our 20kHz high-rate servo control loops, advanced control algorithms and professional analysis and adjustment tools, the settling time of an axis can be reduced to a minimum. Depending on specific application characteristics, a settling time of a few milliseconds is possible. By defining axis stabilization and duration windows, settling time can easily be monitored. Standstill jitter is a critical factor in many high-end applications like wafer inspection or precision inspection systems. Using the SPiiPlus 20kHz servo rate, Sin-Cos encoder multiplier and advanced control algorithms, jitter can be reduced down to ±1 feedback count. This low jitter can eliminate the need for mechanical brakes to hold the axis during standstill. Constant velocity is also a critical factor in scanning applications. With our advanced algorithms, including special torque ripple compensation (cogging), constant axis velocity can be significantly improved to less than 1% of the specified velocity. Our SPiiPlus products include a dedicated tool to accurately monitor the constant axis velocity. SPiiPlus motion controllers provide on-the-fly modification of any motion variable, highly flexible multi-axis synchronization, and I/O event management with sub-microsecond delay. Synchronization between virtual or physical axes can include master-slave, electronic gearing, cam motion, group (vector) motion and more. The generated motion profile is updated each 1msec (as a default) with a new set-point per axis where the control loop is based on linear interpolation between two set points. These powerful capabilities together with the high 20kHz servo rate and sophisticated real-time control algorithms provide very smooth motion with minimal position (following) error.